Girls join Barbie on vacation at the beach. 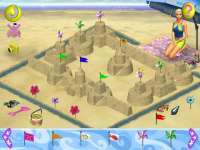 The software offers two modes of play: an adventure mode where players must explore the six activities in a specific order, or an activities mode where players simply play what they want to play. The six activities include: water-skiing, scuba diving, building sand castles, surfing, dancing, and decorating for a beach party. Water-skiing and surfing are side-scrolling arcade games where the player tries to avoid certain obstacles while collecting others. None of these activities is particularly exciting, nor do they make girls think. Girls who like Barbie will have fun playing with her at this virtual beach, but, they will probably have as much fun in their own imaginary worlds with their actual Barbie dolls.